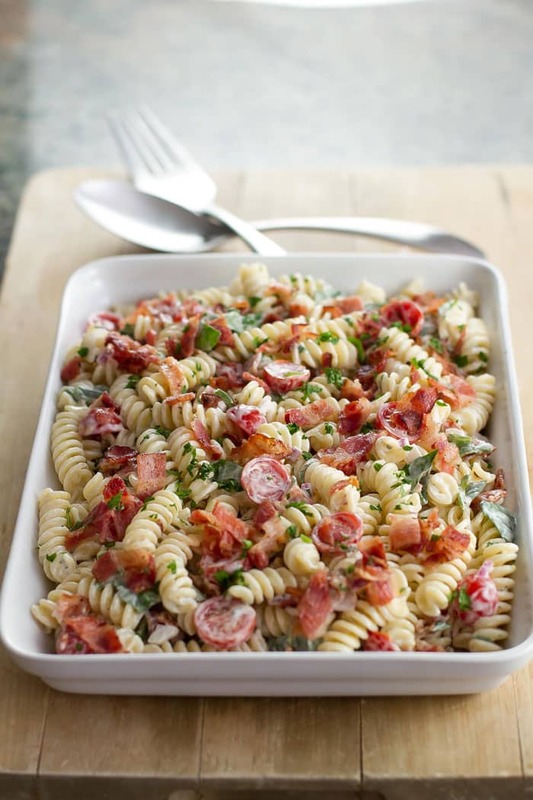 This BLT pasta salad is always a favorite at summer get-togethers or game-day parties. 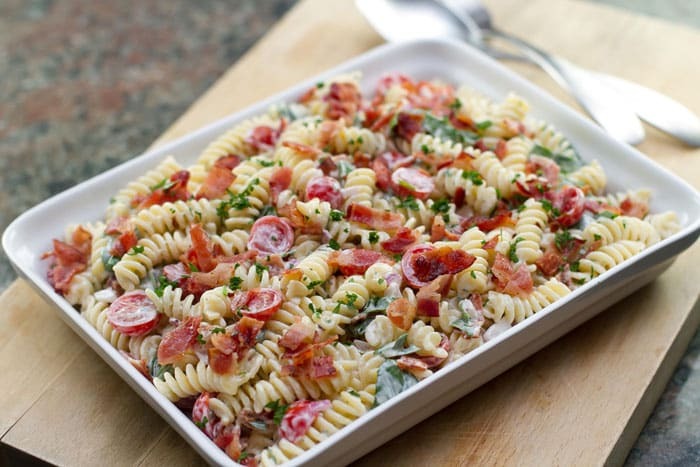 The pasta tossed in a cool and creamy dressing with plenty of crispy bacon, fresh tomatoes, and chopped spinach. Our little cherry tomato plant has suddenly gone crazy and is producing ripened tomatoes almost every day. With quite a few tomatoes on hand, along with an invitation to a potluck, I decided to put together a BLT pasta salad. This version is a take on a favorite sandwich, plus a few other ingredients to add a bit more flavor. You can prep the components ahead of time, but keep the pasta, bacon, tomatoes, spinach and the dressing separate until ready to serve. A fun twist on a traditional BLT this salad has a creamy mayo dressing, crispy bacon, and sweet cherry tomatoes. Boil pasta according to package directions. Drain and rinse with cold water. Spread the pasta out in a single layer on a large baking pan. Stick the pan in the refrigerator until the pasta is nicely chilled. While the pasta is chilling cook the bacon until crispy. Remove from the pan and let the slices drain on a paper towel. Make the dressing by combining the mayo with the thyme, parsley, lemon zest, lemon juice, and salt. Add the chilled pasta to a large bowl. Add the onion, chopped spinach, and cherry tomatoes and toss to combine. Add the dressing and toss everything together until everything is coated evenly in the dressing. Top with the crispy chopped bacon and serve. The salad can be prepped ahead, but keep the pasta, dressing, and bacon separate until ready to serve. [br]Don’t skip chilling the pasta. Hot pasta will cause the mayo to break down and get runny — tossing it with cold pasta will ensure the dressing stays nice and creamy! i was looking around for some sides tonight and found this and omg…i brought it to every party i went to this past summer and it was a hit every time. I think i’m going to make it this weekend and channel warm weather. It’s seriously perfect. What a perfect salad for a potluck!! Everything is better with bacon and what a great way to use your cherry tomatoes! This is my “go-to” recipe to bring to a party. Everyone loves it! I also love making a big batch for myself and I enjoy it for lunch throughout the week. Great recipe, thank you! I made this last night as a side for pulled pork sandwiches to feed a group of people ranging from my 86 year old dad who has not had much of an appetite lately down to 4 teenage boys. Everyone LOVED it and couldn’t stop raving. I doubled the recipe, hoping for leftovers, but the whole bowl was gone. Yay! You got my dad and some picky kids to eat! I thought about omitting the red onions for my boyfriend, who I love dearly but has the sad cross to bear of claiming to hate onions. But I bought the pre diced ones, gave them an extra chop, and even he couldn’t complain just said he loved the flavor. Total homerun and I will be making this again. This looks amazingly delicious! 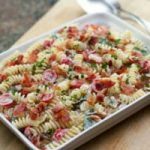 I love a good pasta salad, but never thought of doing a BLT pasta salad. What a great use for our late season tomatoes! Love this recipe. Thanks for sharing! Your pasta salad looks so yummy. Perfect for labor day weekend! Pinned to try it. with BLT in the title – i knew i had to take a look! fantastic idea! Yummy! I was craving a BLT yesterday, this is a nice unique twist! We used to grow tomatoes but now it’s gone. That’s a great pasta dish. If it’s not a sandwich then it would be a pasta. That’s so creative and looks delicious! Great idea! My family would love this! What a great way to put all of your tomatoes to use! Anything with bacon is a winner in my book.